In 1986 London & Country went into LRT route tendering in a significant way, winning several contracts using secondhand Atlanteans from Scotland, Manchester and Tyneside, where deregulation was making the big municipals dispose of surplus vehicles. There was an understandable backlash from the well-healed burghers of inner Surrey, where London Country was operating. They didn't want municipal cast-offs in variegated hues turning up to transport their wives, children and servants, even if it was a direct consequence of Conservative government policy. 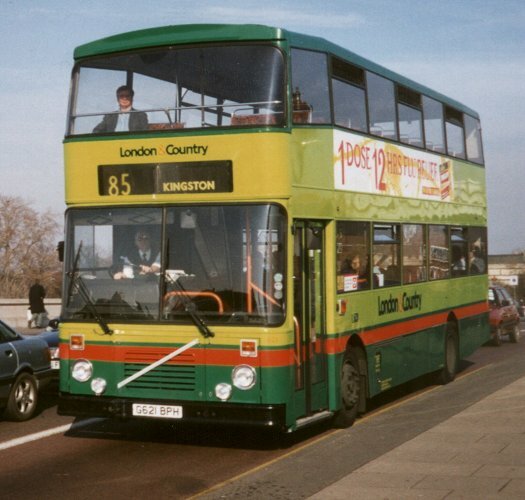 So by 1989 London & Country was faced with having to update its double-decker fleet if it was to win further contracts and have any hope of renewing its existing ones. It stuck its toe in the water with a batch of East Lancs-bodied Dennis Dominators, and borrowed a Volvo Citybus demonstrator (E825 OMS) during January 1989. It then followed that with two further batches of new buses based on the Volvo Citybus (ie B10M-50) chassis, a bus version of Volvo's best-selling underfloor mid-engined coach chassis. The first batch of thirteen had enormous 88-seater East Lancs bodies. They wore the new London & Country livery of two-tone green with red stripe, and were given numbers in London & Country's new 6** double-decker number series. They went into service in September 1989 at Addlestone Garage, principally on routes 110 (Twickenham - Hounslow / Cranford) and 131 (Weybridge / West Molesey - Wimbledon Stn / Clapham Common), displacing ageing secondhand Atlanteans. 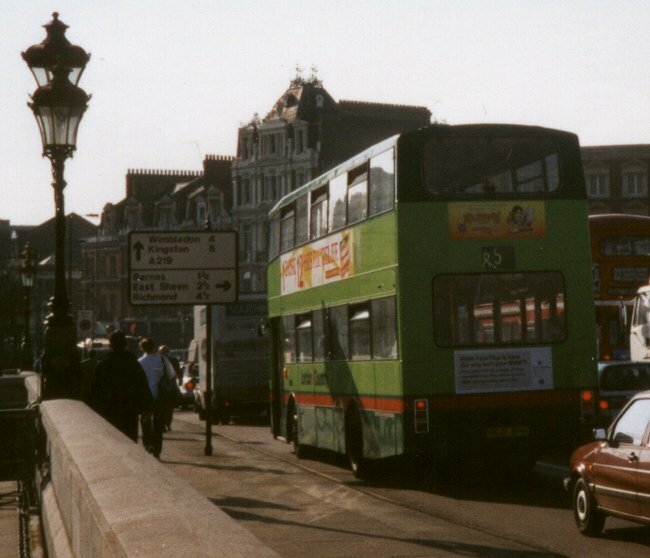 These routes were lost at re-tender in 1990, but the buses found a new home on freshly-acquired route 85 (Putney Bridge - Kingston). 614 found an early home at Reigate, often working on the 727, before going to join its class-mates at Addlestone later in the year. 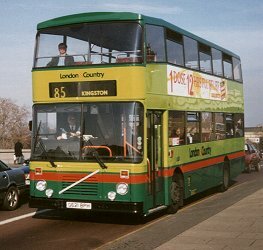 621 was still operating on the 85 in February 1998, when I passed Putney Bridge while walking the Thames Path. This batch mainly joined the western half of London & Country when it was divided up. They gravitated towards Guildford as London & Country lost its other garages, and were later mostly dispersed to other Arriva companies: Colchester and Kent & Sussex (later Medway Towns) were recipients, and some came back to the old Country Area at Northfleet in Kent Thameside, wearing Arriva turquoise and champagne. 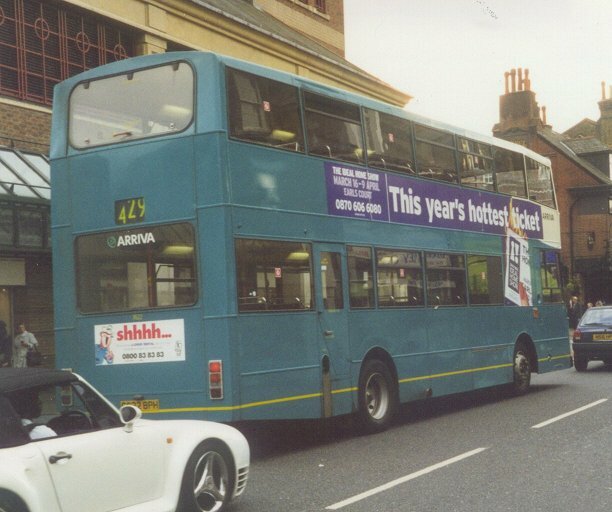 Medway Towns were updated with new double-deckers in June 2004, and the big Volvos moved north to Yorkshire. 7622 was working a 429 Relief between Bromley and Bluewater in March 2000, presumably on loan from Arriva Kent & Sussex to Arriva Kent Thameside..
One real oddity was 611, which fairly early on found itself at Beddington Farm. It stuck there, through the Arriva Croydon & North Surrey days and on into the era when Arriva London South took it over. They renumbered it L611, even though it was patently NOT a Leyland Olympian, and despite their later renumbering of the dual door batch as the VE class. 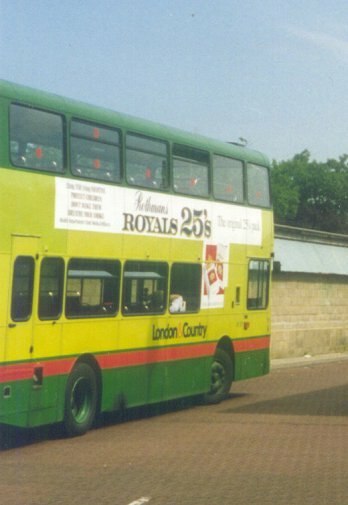 It was used on route 403 alongside East Lancs-bodied Leyland Olympians, and was eventually repainted in red with cream horns. At the same time as the first East Lancs batch, London & Country took delivery of twenty-five B10M-50s with bodywork by Northern Counties, seating a paltry eighty, but with an overall capacity of ninety-nine by virtue of 19 standing, compared with 97 on the longer East Lancs buses which took only 9 standing. They went into service from September 1989 at Chelsham and Dorking, working on the 127 (Tooting Broadway - Purley) and 293/393 (Epsom / Hackbridge - Morden Stn / Merton Abbey Savacentre) respectively. Their stay at these garages was necessarily short-lived, as the consequences of buying your bus company by means of selling all your garage land to a property company started to take effect: Chelsham and Dorking closed, in October 1989 and March 1990, requiring a move of the buses to Godstone and Leatherhead. Godstone received more new ones in October for the 409 and 411, but closed in July 1990, forcing a move from there to the new garaging space at Croydon (Beddington Farm). Dunton Green, although a Kentishbus garage, became an outstation for London & Country with an allocation there from August 1990 for the 320 (Bromley North - Biggin Hill Valley / Westerham). The last four, 644-647, went to Crawley for the C-Line network and for Green Line 773. 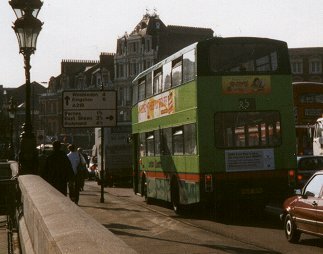 One of the Northern Counties-bodied Volvos was in this corner of a picture I took at Bromley North in June 1993. The following day 625 was on the 320 from Westerham at Hawley's Corner, heading towards Biggin Hill and Bromley. This batch fairly quickly gathered at Beddington Farm for London operations, and were thus much involved with the Londonlinks scheme, when London & County's London operations were lumped together with some from Kentish Bus for a while. This included those outstationed at Dunton Green for the 320. 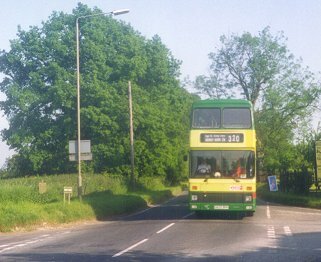 The 320 changed companies to Kentish Bus in 1996, but retained the buses (at Dunton Green). But a year later the 320 was exchanged to Stageocoach at Bromley, and the Volvos moved to Dartford for the 96. Some received the Kentishbus green/yellow livery, followed by Arriva corporate turquoise/champagne. Others had formally returned to London & Country when Londonlinks broke up in August 1997. Some of these also headed for Kentish Bus. Four transferred to Merstham in May 1998 for use on the 410 (Sevenoaks - Redhill). Early in 1999 Arriva Kent Thameside lost the 96 on retender, and the Northern Counties Volvos moved en masse to Gillingham, with Arriva Kent & Sussex. Two went to Plymouth Citybus. The last four, numerically, which spent their brief London & Country days at Crawley, went off early to Bee-Line in Stockport, and thence to Midland Red North. November 1990 saw the arrival of another large batch of East Lancs-bodied buses, this time shorter, with dual doorways to meet the current requirement for LRT tenders for inner city routes. The routes in question were the 78 (Shoreditch - Forest Hill) and 176 (Oxford Circus / Aldwych - Penge), and London & Country acquired operating bases, temporarily at Bricklayers Arms, and then at Newington Butts (NB), as well as using Beddington Farm. The routes had been taken over by London & Country in November before enough of the Volvos had been delivered, and the shortfall was filled using ANs and hired Fleetlines from Sheffield. The red and yellow of the latter gave way to the green, green and red of the Volvos during the period through to March 1991. The allocation moved to the ex-LT garage at Walworth in December 1992. The 78 was shortened in March 1994 to Peckham Rye, but the Volvos also appeared on the 188 (Euston - Greenwich), alongside Londonlinks' Titans. Walworth became a garage for Londonlinks in February 1995, and the buses were progressively given new fleetnames, and a revised livery with more light green. The Londonlinks operation was dismantled towards the end of 1997, the 176 being transferred to Arriva London South at Norwood in July, with 22 of the buses, the remainder, used on the 188, following in August. Norwood repainted some of the Volvos red with yellow diagonals. It classed the buses VE. But it did not keep them long. 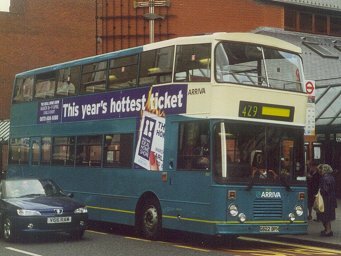 Spring 1998 saw many of them dispersed northwards, to Arriva Midlands North, Arriva Derby, Arriva Manchester and Arriva Scotland West. Tillingbourne bought three of the ex-London South buses, (673,678,683) for use on busy Reading services, and painted them blue/yellow. Meanwhile, back in 1996, Londonlinks and Kentish Bus acquired ten more of the large single-door East Lancs buses from North-Western. These were very similar to the original London & Country batch, with huge rear overhangs. Four were repainted in Londonlinks colours and sent to Walworth to work the P3. But in November 1996 the P3 was lost to Selkent, and the four Volvos moved to Croydon. The other six were painted in the new Kentish Bus green and yellow livery and went to Dartford. They stayed there into Arriva's turquoise and cream era, until displaced by red low-floor buses in early 2004. Even then some hung on at Northfleet, their size useful on schools contracts. The Croydon four were renumbered in May 1998 to avoid a clash of numbers at Beddington Farm, and received fleet numbers matching their registrations. 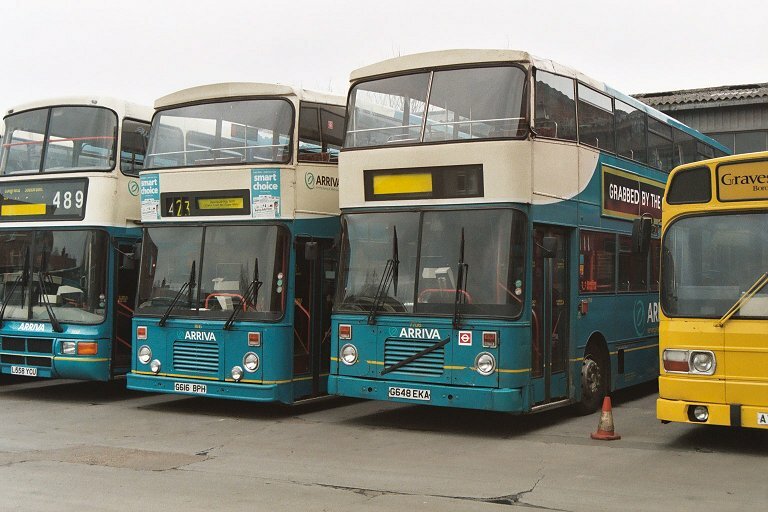 Two went back to Arriva North-West later in 1998, while the other two were later sold to Plymouth Citybus. 7616 from the first batch, and ex-North-Western 7706 were still operational at Northfleet Garage in March 2004.